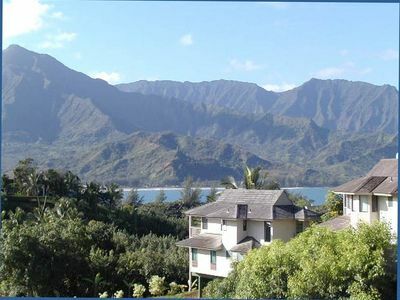 Hanalei Bay Resort is a 5 Star Resort and is widely regarded as one of the nicest places to stay on Kauai. 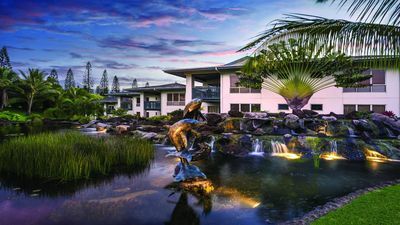 8232 is ideally situated on the 'point' of this 22 acre Resort giving you spectacular views! 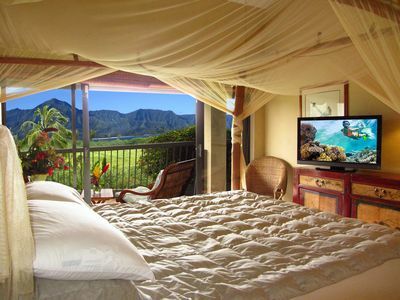 This 1 bedroom suite w/loft has some of the best views in all of Kauai. 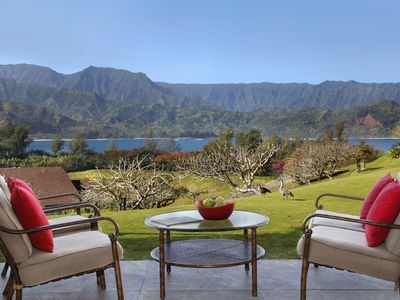 Unobstructed views of Bali Hai, Hanalei Bay, the Pacific Ocean, and panoramic 180 degree views of 4000 ft. mountains laced with waterfalls are yours when you look out or step out onto the private lanai. 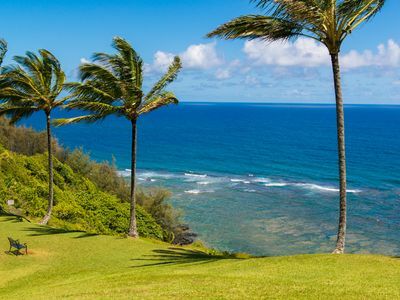 One of the rare unobstructed views left on Kauai. 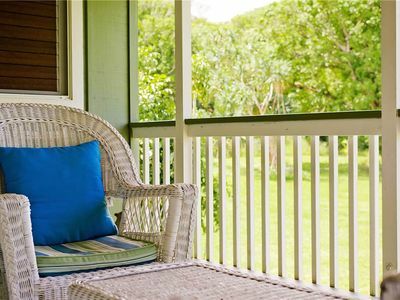 From the lanai you overlook a protected bird sanctuary while watching and listening to the white water surf of Hanalei Bay. 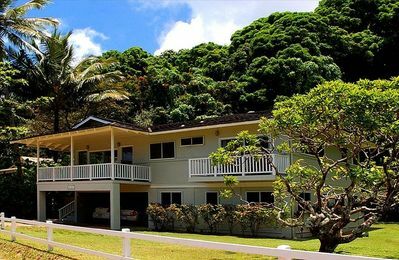 This 1 Bedroom condo also has a separate lockoff/hotel style room (8231)with a King Size Tropical Canopy Bed with a full Master Bath and private Lanai that sleeps 2 for added flexibility and budget. WHEN INQUIRING, PLEASE LET ME KNOW WHICH CONFIRURATION YOU ARE INTERESTED IN. 8231 sleeps 2, 8232 sleeps 4, 8231/32 sleeps 6. THIS CALENDAR IS FOR THE 1 BEDROOM SUITE, 8232 ONLY. 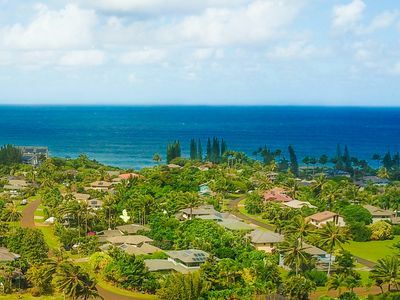 This condo is a top floor unit, which gives you better views, improved security, vaulted ceilings for a much larger feel, and you don't have the noise of people above you. 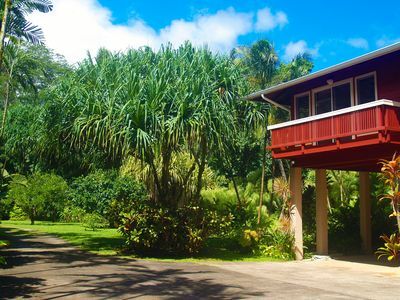 However, this is one of the few 2 story buildings on the property; most are 3 stories, so you don't have to climb 2 sets of stairs every time you enter or leave. There are only 6 steps to reach the front door. 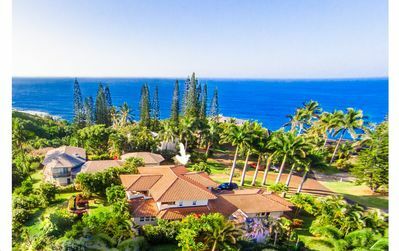 Furnished in authentic Pacific-style with Hawaiiana and Polynesian antiques from around the world - including China, Thailand, the Phillippines, Bali, and Burma - this beautiful condo has an amazing collection of old Hawaii touches. The spacious interior is not only elegant, but interesting and relaxing. Completely renovated by a well known designer from New York, you will find elegant white tiled floors throughout. 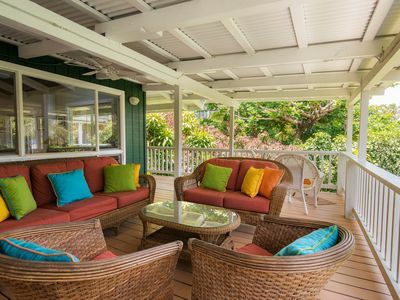 Tropical fans give the condo a spacious and elegant feel. The bedroom has a romantic king sized canopy bed and the oversized loft has a pair of Mahogany twin beds with brand new mattresses, allowing the condo to sleep 4 people in beds. We also have air mattresses if necessary for up to a total of 6 people. 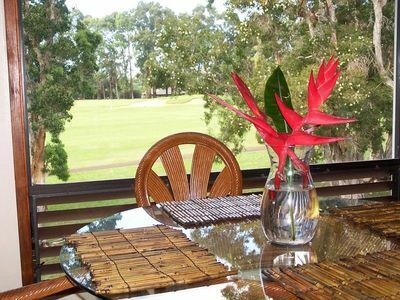 Your private lanai has teak furniture, and the condo has a complete kitchen for cooking meals when you're not dining at one of the fine local restaurants. 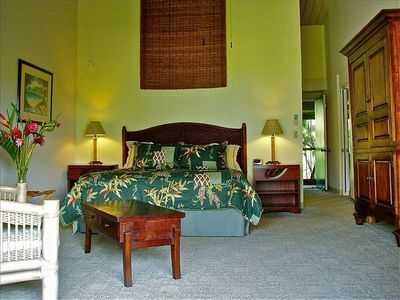 The bedroom has its own flat screen TV with DVD and the entire unit has wireless internet access. A washer and dryer are also in 8232 (one bedroom suite). 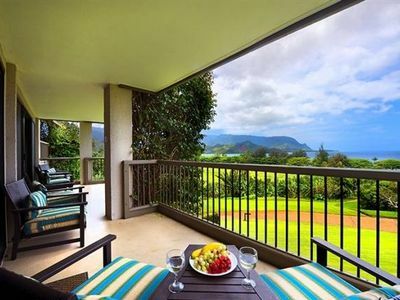 Princeville Condo w/ Great Views and Beach Access! 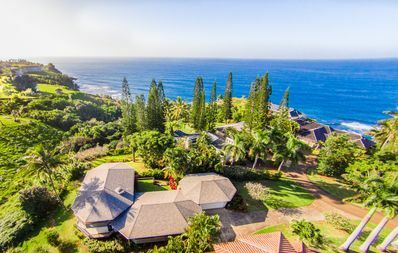 Gorgeous 5 br 5 ba for 12 ocean view estate above Kaweonui Beach! 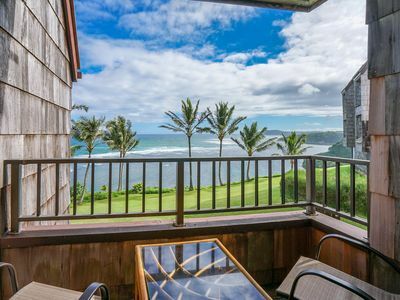 Beautiful 5 br cliffside home for 10 above Kaweonui Beach! 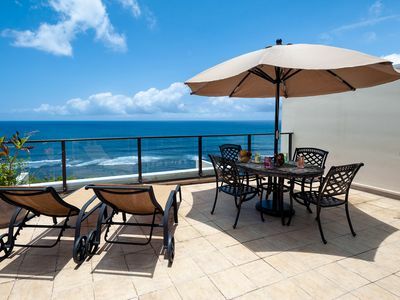 Enjoy Luxurious Bali Hai Villas! 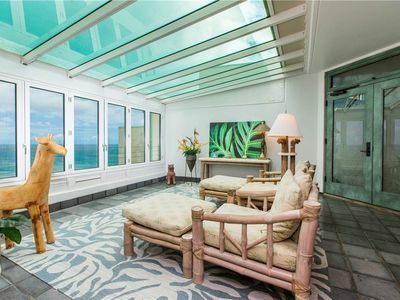 Puu Poa 405: Ocean views & 2,000sf of living space. 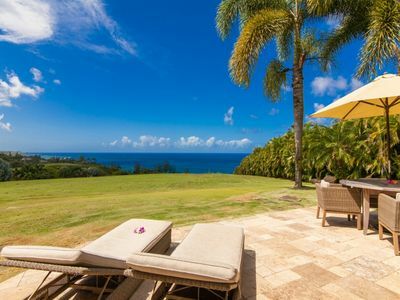 Private lanai and grill. 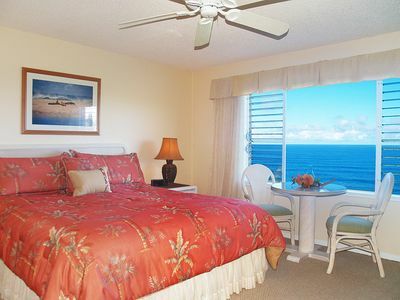 Oceanfront condo w/ shared pool, WiFi, full kitchen. 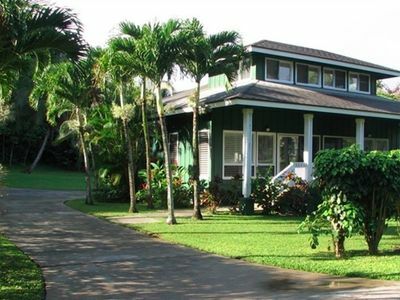 Fantastic 3 Bedroom Princeville Home for 6!